Microsoft's HoloLens headset is part of the company's new inclusive computing initiative that spread Windows 10 evenly over a number of devices. It was unveiled in 2015 and will go on sale in "Q1 2016", priced at $3,000. The headset is unlike anything Microsoft has attempted before, and demonstrates the way that the company has put the days of being slow, methodical and predictable behind it. 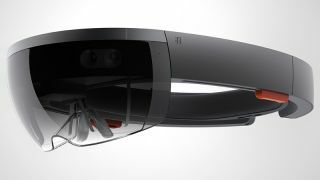 Whereas the Microsoft of old would've waited until HoloLens was a finished product – by which time, leaks would've revealed just about everything about it anyway – the New Microsoft is unveiling new features, functionality and details over an extended period. • Read our hands-on review here. • HoloLens is an augmented reality (AR) headset, overlaying graphics and text on the real world as you see it through the device's lenses. This is not to be confused with virtual reality (VR) where all you see is the created world. Microsoft describes it as "mixed reality" or "hologram computing". • HoloLens will cost around £1,950/$3,000/AU$4,100 for the "Developer Edition". • This will be available to developers in "the first quarter" of 2016. To you, in a finished, consumer version? Most likely 2017 at the earliest. • Although it plainly has uses in gaming - Minecraft is being pushed heavily as a killer app, and looks spectacular - what we've seen of it suggests it will be more for use in work spaces, marketing and promotions, and novelty demos. It could also be used as a general Windows interface, though clearly the price makes widespread uptake of this unlikely. • Read our review of the HoloLens price announcement here. • As far as Microsoft is concerned, HoloLens is a "Holographic computer". The headset is part of the Windows Holographic subset of devices. Its operating system is part of Windows 10. • Our gaming expert's take on how HoloLens compares to Oculus Rift. The Developer Edition of the headset will cost $3,000 (that's about £1,950/AU$4,100). While this may seem expensive, pre-production hardware often is – witness the Explorer Edition of Google Glass. The release date is as yet unknown. Satya Nadella, the CEO of Microsoft, said in an interview that HoloLens would be available "in the next year" but gave no specific date. The technology is, of course, very advanced and it will be a while before your Mum takes order of hers. Microsoft's recent forays into hardware – namely the Surface line – has taught the company a lot about supply chains and actually manufacturing hardware. This in turn means that the rollout of HoloLens should be smooth, when it does happen. Normally, we'd expect that to point to an arrival date in 2017 for a consumer version of HoloLens. However, it's worth pointing out that Microsoft CEO Satya Nadella used the phrase "five-year journey" with reference to the headset when talking to the BBC, so maybe don't start saving just yet. Our overall impression is that, while the technology is impressive, there is still a way to go. The concept is sound but the present implementation leaves a lot to be desired. There is undoubtedly an issue with the narrow field of view. While the demos Microsoft shows on stage include vivid scenes of an augmented reality, the actual reality of using HoloLens is a bit different. Think more looking through a letterbox at something magical rather than seeing it all around you. As noted, the "sweet spot" for the holograms is a box within your field of view. On prototypes to date, you have to be looking straight at this screen within a screen to see the graphics properly. If you move your eyes or head so the HoloLens gets out of optimum position, the images are partially cut off. It didn't ruin our fun, but it makes using HoloLens less natural than it could be.